IBM® PowerHA® SystemMirror® for i is the IBM high-availability (HA), disk-based clustering solution for the IBM i operating system. When combined with IBM i clustering technology, PowerHA for i delivers a complete HA and disaster recovery (DR) solution for business applications running in an IBM i environment. You can use PowerHA for i to support HA capabilities with either native disk storage, IBM DS8000® storage servers, or IBM Storwize® storage servers. 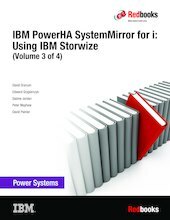 Use this IBM Redbooks® publication to help you install, tailor, and configure IBM PowerHA SystemMirror for i with the IBM Storwize storage servers. This publication provides you with planning information to prepare for using the various PowerHA offerings for the IBM Storwize storage family. It also provides implementation and managing information. Finally, it provides guidance on troubleshooting these solutions and identifies the documentation that you must capture before calling support. Important: The information that is presented in this volume set is for technical consultants, technical support staff, IT architects, and IT specialists who are responsible for providing HA and support for IBM i solutions. If you are new to HA, you should first review the information that is presented in the first book of this volume set, IBM PowerHA SystemMirror for i: Preparation (Volume 1 of 4), SG24-8400, to get a general understanding of clustering technology, independent auxiliary storage pools (IASPs), and the PowerHA architecture.